Ramon Zürcher's tightly composed, minimalist directorial debut, The Strange Little Cat, is, in a way, the ultimate modernist horror movie. It presents itself with the sunny, almost farcical disposition of a sitcom, featuring a family in a small Berlin apartment exchanging seemingly banal observations over the span of 24 hours. However, it possesses an unnerving, underlying sense of unease that simmers beneath the big, blank smiles and cool passive-aggressiveness. Very little actually happens, in the traditional narrative sense: over a single day, three generations of a family each go through the usual motions of playing games, feeding pets, doing laundry and so on. But it's the orchestration of their movements, manoeuvring around each other in cramped hallways, emulating each other's behaviours and the implications of their anecdotes — all of which are repeatedly interrupted by the sounds of appliances and irrelevant sidebar conversations — that tell the real story. Initially, the mother conveys to her oldest daughter a tale about going to the movies. While there, a man placed his leg over hers, presumably accidentally, which she left, assuming he'd realize his error and move it. When he didn't, she felt she'd left things too long to do anything about it, so she sat there unable to focus on anything but the leg, waiting for something to happen. This passivity and self-imposed helplessness tie in with a follow-up anecdote from her daughter about throwing orange peels on the ground. While walking along a path with a uniform rhythm — the exactness of her movements and seeming perfection of the moment being key — she noticed that her discarded peels always landed orange side down, which she gathers has to do with weight. What isn't discussed, and what lingers in the periphery, is this: "what happens if the orange peel metaphorically lands with the orange side up?" With the youngest daughter screaming every time an appliance makes a noise and the youngest son flying his toy helicopter around a crowded kitchen while family members try to eat, there's always an anarchic sense of oppression. The noise, the constant babbling and interruptions from neighbours ensure that no one has a quiet moment of introspection, which is most evidently problematic for the mother, who feels the weight of it all. What's most disturbing about this dynamic is the avoidance of conflict and emotion. When the youngest girl cuts her finger, her older sister rubs the blood on her nose and says, "Now you're a clown!" Later, when she pulls a loose button off her brother's shirt, her mother slaps her across the face, but she doesn't react at all. That a child wouldn't react to violent, harmful situations in the slightest is indicative of the seething numbness fuelled by the insincerity and performance of the family unit. Throughout, sequences with juice squirting from a sausage and a cork bursting out of a bottle represent the slow building, underlying pressure — ready to explode at anytime — lying beneath the empty exchanges. As the title suggests, the pet cat, who's imperilled by family members holding their feet over its head while it eats, is always the closest in proximity to the potential violence, being thrown off tables and evading thrown projectiles. This persistent, impending danger, and the consistent tendency for everyone in the family to toss toys at each other with a little too much force, works as a metaphor for the world outside of the crowded family apartment. The children, reiterating the passive-aggressive, resentful actions of their parents, take out their frustrations on those beneath them — when the youngest girl asks her older sister to help with a task, she responds by "jokingly" looming over the small child, pointing out that she is the smaller, submissive party — leaving the cat, the least significant member of the family, in the worst position. That this disturbingly astute social observation is communicated with such a distressingly peppy, satirical ease by a first-time filmmaker is quite astounding. 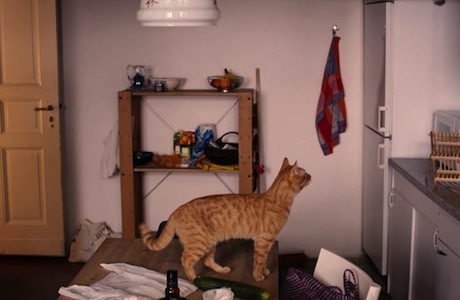 The Strange Little Cat has the assuredness of a work from a master director, being an exercise in precise form and choreography, oozing meaning from every seemingly incidental frame. It's also a very important work, observing the underlying problem with polite society in a way that would likely evade those most prone to contributing to the overall issue.